Network testers are ideal for IDing bad cabling, helping to troubleshoot network issues, estimating cable lengths and determining cable rates. Here's a look at three that can do the job and provide a range of features. It’s not good enough to run cables and just hope they work, or simply say it’s all good if they provide a working network connection to the computer or device. You should double-check by testing or qualifying the cable runs before you call the job complete. You should use a tester to check if all the cable pairs are intact and correctly wired and see if the cable can truly handle the data rates you desire. Network testers can also be a lifesaver when troubleshooting network issues or making changes to the wired network. They could for instance tell you which cable pairs you might have mixed up when terminating the cable. Or if you’re working on someone else’s network install that didn’t document or label any cable runs, you can utilize the tester to help identify where the cables are running. Here we take a look at three different network testers from three of the major players: Fluke Networks, NETSCOUT, and SignalTEK. All three of these testers can check cable pairs and wiring, estimated cable lengths, and data rates. Plus all can blink the switch port LED lights to help identify the port you’re testing and send tones across the cable to physically locate the cable throughout its path using a separate tone probe. The Fluke Networks CIQ-100 is the most basic tester and least expensive of the three we reviewed. It’s designed just for cable qualification, can test Ethernet and coax runs but has no fiber support. The NETSCOUT LinkRunner G2 and SignalTEK NT units are the most similar in regards to what they test. Both support Ethernet and fiber cables. They give details on any connected switch, PoE capability and test for IP network/internet connectivity. The NETSCOUT unit is the most expensive of those tested but also has the most functionality, a touchscreen, and an Android OS. The Fluke Networks CIQ-100 ($1,385) is a qualification tester for copper media (twisted-pair, coax and audio) that can test speeds and troubleshoot cables. It comes with a main unit to run standalone diagnostics and a remote unit for the cable testing. It doesn’t show switch info and network IP info like the two other solutions, but it’s not designed for that. It’s more for strictly testing the cables. The main unit measures about 7 inches high, 3.5 inches wide, and 2 inches deep. The detachable remote unit on top measures about 1.5 inches high, 3 inches wide, and 1.5 inches deep. The main unit is encased in a durable plastic cover, which also has a retractable stand on the back to prop up the unit on a surface. There’s a Mini-B USB port on the bottom right side of the unit for transferring the test data to a PC and to update the unit’s software. There’s no included power supply because the unit isn’t rechargeable; it takes 4 AA batteries. This could be a significant inconvenience for those using the unit often. We reviewed the CIQ-100 unit with hardware version 3 running with software version 1.6. The main unit has a rotary knob to move between the difference modes. There are arrow buttons and an Enter button to navigate the menus and options on the screen, however the Enter button is offset and would be a little more user-friendly if it were in the middle of the arrows like most other devices. Additionally, there are two function buttons to perform any function listed above on the LCD screen. There’s also an Exit button to cancel or go back in the menus. There’s a brightness button to toggle between two different screen brightness levels. Lastly, there’s a Test button to perform the selected test(s). Eric GeierA summary of the AutoTest results are shown and you can select each to see further details. In the Setup mode you can configure the tests, cable-length calibration, user info and other miscellaneous settings. The Auto Test mode is where you go to perform the main tests cable tests, which requires you to have the remote unit plugged into the other end of the cable. At the end of the tests, you can save the results and specify a Site, Location and Outlet. The Discover mode gives you the estimated cable length, speed, duplex and pairing, which doesn’t require any termination at the end of the cable. However, unfortunately, you can’t save these results. The Results mode only allows you to view the results from the auto tests you’ve saved. But you can conveniently view the results from all the saved tests right on the unit. The Tone mode allows you to send tones across the cable that you can use with the separate IntelliTone Probe to physically find cables throughout their path. The DIAG mode allows you to perform a couple diagnostics: blink the switch port LEDs, read cable continuity, find crosstalk or impedance faults and play audio for a speaker test. In their PC software, you can sort through the test results and optionally save, export into a CSV file, or generate a PDF report. To get the results off of the main unit, you must download Fluke’s PC software to a computer and connect the unit via the mini-B USB port. We evaluated version 2.0. Once you import the results from the unit, you can generate PDF reports, export in a CSV file or save in their proprietary format so you can later re-open the results in their PC software. The PDF report includes the cable IDs, site information, and report logo, which all can be modified in the PC software. Overall, this Fluke Networks tester is a good choice if you only want to qualify cables and aren’t concerned with the general network connectivity. We like how the remote unit has status lights and a test button, which can be very convenient when out in the field. But there is room for improvement with this solution, such as adding a rechargeable battery and streamlining the data export process. The NETSCOUT LinkRunner G2 ($3,064.99) is a network tester for copper and fiber Ethernet connections with automatic cloud sync of the results to their Link-Live service. The unit’s Android OS provides additional possibilities as well. Browse the web, take photos and use the other free Android apps provided in the NETSCOUT app store. 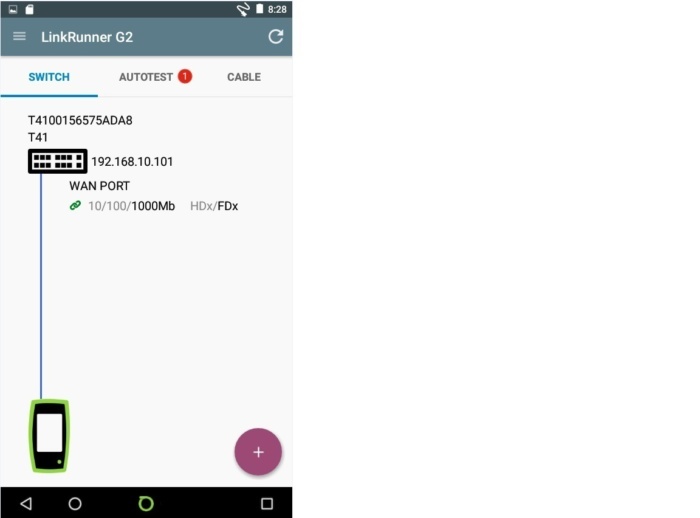 Additionally, you can purchase the Wi-Fi/Bluetooth adapter to do informal Wi-Fi testing or utilize nearby Wi-Fi networks for internet access. The basic LinkRunner G2 basic kit (LR-G2) comes with inside a carrying/storage bag. Along with the LinkRunner G2 basic kit (LR-G2), you receive a power supply with regional power plugs, WireView Cable ID #1 (their remote unit for testing), inline RJ-45 coupler, USB 2. 0 to Micro USB cable, 8GB Micro SD card and a getting-started guide. This all comes in a soft storage/carrying case. The main unit with the LinkRunner G2 app on the Switch tab. The main LinkRunner G2 unit measures about 8 inches high, 4 inches wide, and 1.5 inches deep. The power button is the only button the top because it has a touchscreen. On the right side of the unit, though, are volume buttons, micro USB port, SD card slot and a power input. On the top of the unit are the fiber and Ethernet testing ports, along with a USB port for connecting an optional Wi-Fi/Bluetooth adapter or a flash drive for additional file storage/transfer. On the left side of the unit is an additional Ethernet port for testing patch cables. The separate remote unit, the WireView Cable ID, is about the size of a flash drive with a male RJ45 port on the end. You can plug it onto a patch cable end using the included RJ45 coupler. As you can see, not all info can be detected from some switches. When you power on the unit, it automatically opens to the LinkRunner G2 app. We reviewed the app version 1.00.15. 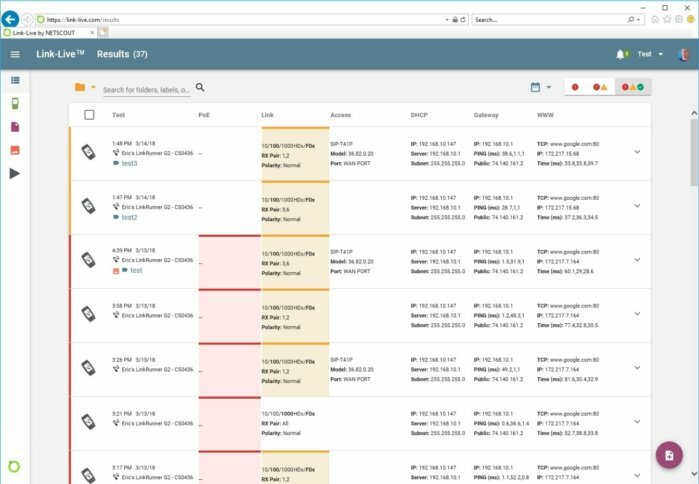 On the Switch tab, you can view the detected switch details, such as the switch name, model, IP address, port, VLAN, speed and duplex, and PoE voltage and wattage. You can also flash the port’s LED lights. Eric GeierA quick overview of all the tests are shown and you can tap each one to see further details. 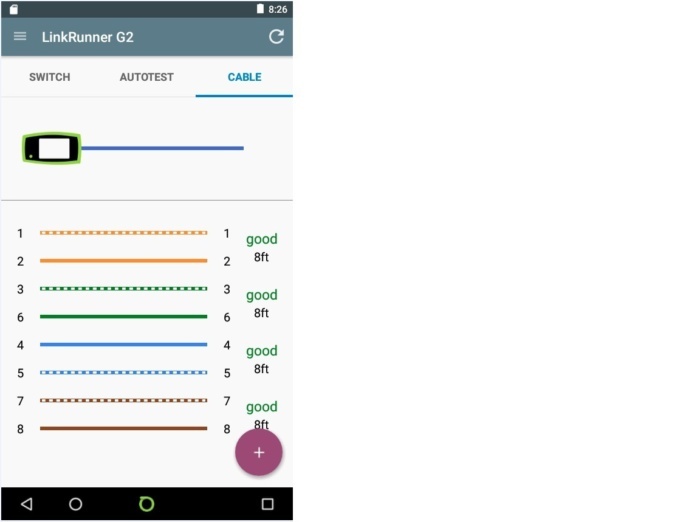 The AutoTest tab automatically runs all the tests: PoE, speed and duplex, DHCP, DNS, gateway and ping or TCP. You can also add photos or text comments. All those results and any media are also automatically emailed to you and uploaded to your Link-Live account. The automatic uploading of the results is convenient, but it would be nice to be able to easily disable the feature if you are doing a lot of miscellaneous troubleshooting and don’t want a flood of emails and result uploads. You get a nice colorful representation of the cable pairs along with estimated lengths. On the Cable tab you can test cables via a couple of different methods. You can connect an open (unterminated) cable to measure its length and view any shorts, opens or splits. You can connect a patch cable from the top RJ-45 port to the side RJ-45 port to view its length and wire mapping, including any faults. 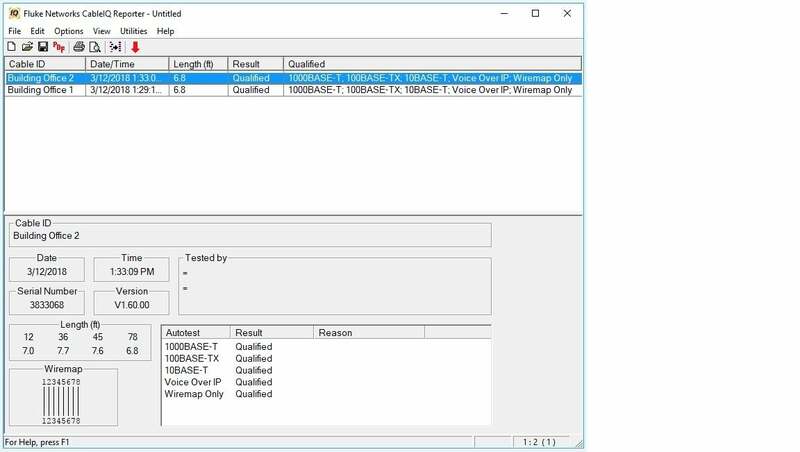 You can also connect a cable terminated with a remote WireView Cable ID accessory to view cable length and wire mapping, including any faults. Unfortunately, none of the cable test results are uploaded to Link-Live, nor can they be saved except for screen shots. On the Cable tab you can also enable the toning function so you can utilize the separate IntelliTone Probe or other third-party probe to physically locate cables along their path. On the app menu, you can input a job name, which will then appear in the results and reports on your Link-Live account. This helps you distinguish among the tests that are automatically uploaded. However, the job and result-management functionality is very basic in the app. It would be nice to see a history of the jobs and test results in the app on the unit, rather than having to always login to the Link-Live website. 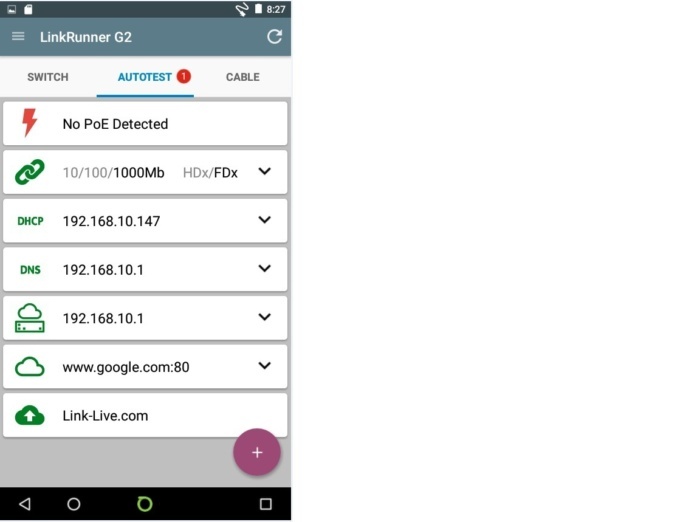 In the app Settings, you can configure different test profiles with settings for the PoE detection, 802.1X authentication, VLAN assignment, IP info, custom MAC address and custom test ping or TCP targets. A summary of the automatically uploaded results are shown in a list and you can click them to see further details. 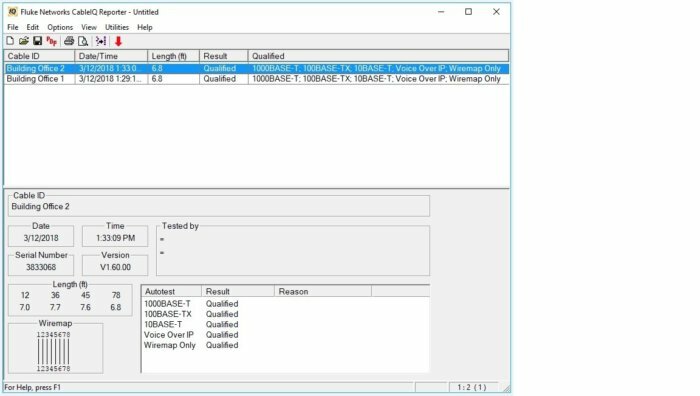 You can bring up the Link-Live website on a computer or device to see all the automatically uploaded test results along with those from any other NETSCOUT devices you have on that account. You can search and filter the results and also export them to PDF and/or CSV reports. No complaints here, but it would be nice to have similar access to the results and reports right within the app when using the unit. 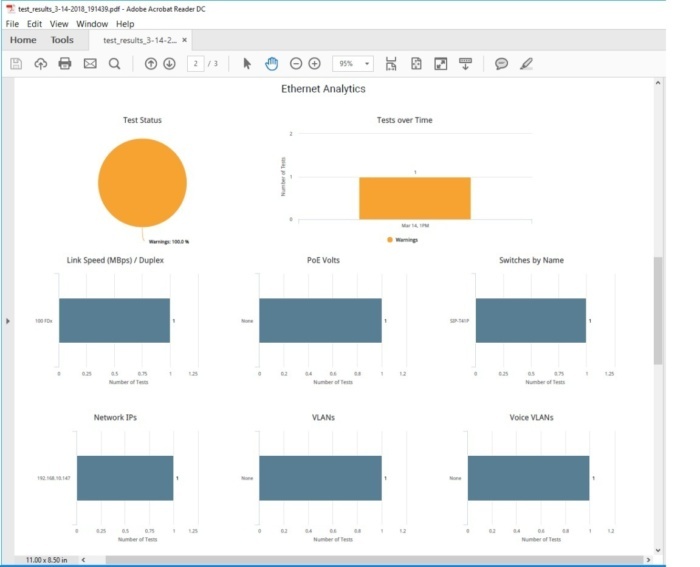 The exported PDF reports also gives you nice graphs on the results. We found LinkRunner G2 to be a solid tester that provides the most functionality of the three we evaluated. Its Android OS and cloud syncing adds great value. However, it’s in-app job management and test-history features could certainly be improved. The SignalTEK NT ($2,408) is a network transmission tester solution designed by IDEAL Networks to evaluate the performance of cables and wired networks. It has port identification, ping and traceroute tools. It comes with a main unit to run standalone IP tests and a separate remote unit that can be paired over a network for the performance testing. The entire SignalTEK NT kit along with the storage/carrying case. Both units are the same size (about 7 inches high, 3.25 inches wide and 1.5 inches deep) and have a plastic casing with a blue-and-gray color scheme. They come in a durable storage/carrying case, along with power supplies for recharging the units and two, one-foot Ethernet cables. On the main unit, you have a non-touch LCD screen with function and navigation buttons, plus an Autotest button that runs all the tests. We evaluated the unit with the software version 1.0.8. On the left side is a RJ45 port and an optical (SFP) port. On the top of the unit is a USB port, which has a small Wi-Fi adapter plugged in so you can connect via Wi-Fi from SignalTEK’s mobile app to see the reports. between it and the main unit, next is the test status and then three lights to show the data rate: 1,000, 100, or 10 Mbps. There’s also an Autotest button on this unit to start all the tests on the main unit. After it powers on, you can select the test connection: RJ45 or optical. Once you plug in a cable, it automatically attempts to link up to the remote unit or obtain an IP address from the network. You’ll see the detected data rate. If connected to a network, you’ll also see the switch port number and MAC address and IP info. You can then select a particular test to run or hit the Autotest button to run all. It also has the ability to blink the switch port LED lights and send a tone signal so you can utilize a separate tone detector to physically find cables throughout their path. You can utilize their jobs feature to separate tests into specific jobs – perhaps a different job for each location or building. You can see a history of the jobs and the pass/fail results of tests for each. On the Setup screen you can configure settings and preferences of the unit, tests, IP connectivity, test ports and test reports. This is an example of a PDF report you can export with their mobile app via Wi-Fi to the main unit. 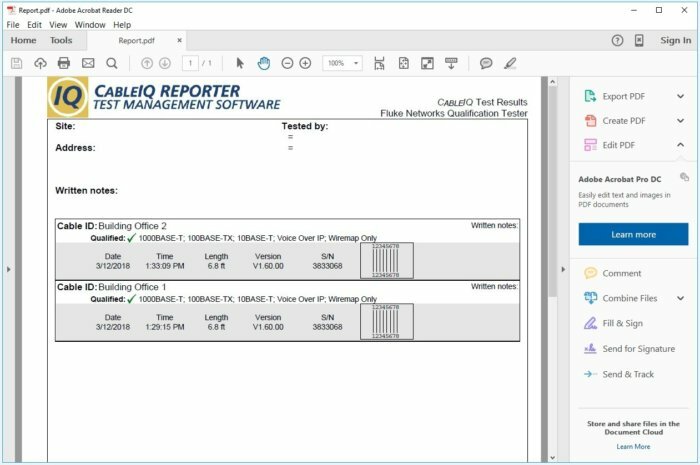 You can get the PDF and/or CSV reports from the tests off of the unit by plugging in a USB flash drive or via a mobile app (IDEAL AnyWARE) from your separate Android or iOS device. When using the mobile app, you’d connect to the main unit’s Wi-Fi network from your mobile device, and then on the app select the jobs you want to download to the mobile device. Once the job is on the mobile device, you can view and/or share all the PDF and CSV reports via the typical mobile share options. But before you can share, you must first disconnect from the main unit’s Wi-Fi because it doesn’t have an Internet connection, regardless if it’s plugged into an active network. 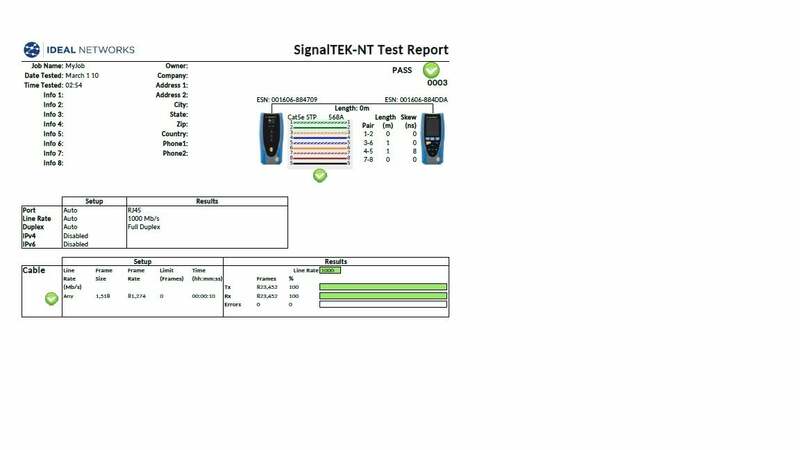 Overall, the testing and configuration functionality and settings with the SignalTEK NT units were all straightforward. Everything with using and setting up the units seemed as user-friendly as it could get. They modernized the data export process with the mobile app, but it sure would be nice if they supported cloud syncing as well.